FUNding FACTORY exhibition, Open Space, Vienna. Opening soon is a project I have been working on with Open Space gallery in Vienna. The project is connected to my PhD research and is an attempt at investigating the ways in which artists, commissioners, critics, curators and funders negotiate ‘the cultural production line’. The FUNding FACTORY attempts to interrogate the desire that many artists share: to disrupt expectations of the function of art whilst fighting for the right to be paid to do that dismantling. The gallery will be transformed into a factory for the metaphorical mixing, compressing, tinkering, testing, rejecting, approving, wrapping, packaging and distributing of culture. Found, discarded and donated material from skips, studios and galleries is recycled to build the make-shift cultural production line. Embedded in the factory are video portraits I have made of staff and associates of Open Space about their experiences of negotiating these dilemmas of survival, ideology and criticality. Students at the University of Applied Arts have been invited to intervene into the factory to reflect on their own positions as future ‘creative industry-workers’. Participants include: Fahim Amir, Fatih Aydogdu, Gulsen Bal, Barbara Holub, Fran Hope, Domenico Mühle, Tina Raffel, Walter Seidl, Christoph Srb, Corina Vetsch and Reinhold Zisser. Emotional Cartography is a collection of essays from artists, designers, psychogeographers, cultural researchers, futurologists and neuroscientists, brought together by Christian Nold, to explore the political, social and cultural implications of visulising intimate biometric data and emotional experiences using technology. Council for Galician Culture, Santiago de Compostela, Galicia. I will be doing a presentation as part of the Council’s programme, ‘Arts and Public Space’. I will be taking part in a panel discussion with Ana Laura Lopez de la Torre, and Dave Beech, organized by Sonya Dyer as part of the Chelsea Conversations series. Tactical Play: Playful enquiry as a tactic for change in socially engaged art and the social sciences, Birkbeck, University of London. Fellow PhD student Elaine Speight and I are organising a symposium with the Birkbeck Institute for Social Research in July that aims to bring together artists and social scientists who are using play as a method. More details to come soon about the speakers and booking details. Your feedback requested on new writing! I have commissioned two new articles for the ixia website. 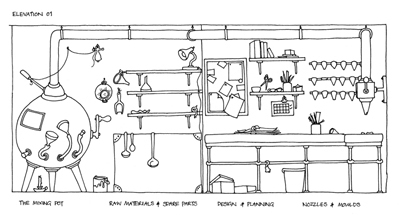 They are the case study report on The Blue House in Amsterdam by Paul O’ Neill and a report on ‘How people experience built environments’ by Dr Begum Basdas, Dr Monica Degen and Professor Gillian Rose. There are now 8 articles on the site and we are inviting feedback on these articles. If you would like to feedback on the writings please contact info@ixia-info.com and title your email ‘New Writing feedback’. I am currently working on a project called Critical Friends with the arts organisation Stream (formerly Independent Photography) in Greenwich. Critical Friends is a group of people who live or work in the area, including staff of Stream, who are developing creative ways of investigating, critiquing and feeding into the commissioning of art, specifically in relation to Stream's Peninsula art programme in Greenwich. We have a magazine, workshops and blog as sites for writings, documentation, performances and presentations which we have created. Critical Friends is facilitated by Sophie Hope and Rebecca Maguire. The next magazine is due out in May 2009! As part of the Networked Cultures: Politics of Connectivity session organised by Peter Mörtenböck and Helge Mooshammer, I presented a paper titled, What Ever Happened to Cultural Democracy? After introducing the paper I worked with five volunteers from the audience to present a conversation I had scripted between five ‘critical friends’. Alex Hodby played Paulo Friere; Lee Rodney played Jacques Ranciere, Helge Mooshammer played Ivan Illich, Rachel Ashcroft played Sheila Rowbotham and Lynne Fanthome played Trinh T. Minh-ha. The script, along with the other papers given that day, will be available on the Networked Cultures website soon. Nutopia. Exploring the Metropolitan Imagination, Morgan Arcade, Cardiff, 2-3 April 2009. Jennie Savage brought together an international mix of people to present papers, lead walks and facilitate workshops during this amazing two day event that was held in a recently closed down clothing shop in one of the old shopping arcades in Cardiff. The symposium was part of a long-term project Jennie has been doing in the arcades and the centre of Cardiff, which is currently a building site as streets and buildings are cleared to make way for the large new shopping mall. As part of the event, I contributed by hosting a drinking game with a small group of participants from the symposium as a way of writing ‘The Arcade Treaty’ which we presented back to the group the following day. 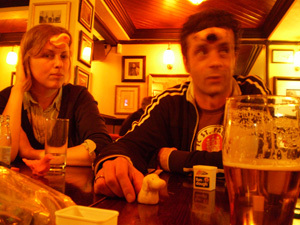 We sat in The Cottage pub on St Mary Street wearing animal noses and took it in turns to suggest points for the Treaty which the group drank to if they agreed. This exercise revealed how absurd the decision-making process is, the difficulty of coming up with alternatives and the various ideologies of the individuals involved. We wondered if Barak Obama, Gordon Brown and other world leaders were using a similar methodology to solve the economic crisis during their G20 meetings. Malcolm Miles was the Cat, James Hill was the Dog, Katy Beinart was the Duck, Karen Said was the Mouse, Vahida Ramujkic was the Wolf and Sophie Hope was the Rabbit. 'Exploring Critical and Political Art in the United Kingdom and Serbia' - Sophie Hope & Marko Stamenkovic in ‘Art and Theory After Socialism’, edited by Mel Jordan and Malcolm Miles. Drawings documenting ‘Het Reservaat’ in ‘A trama rururbana. Documentos de trabajo’, edited by Carme Nogueira, published by: Centro Galego de Arte Contemporánea, Santiago de Compostela, Xunta de Galicia. ‘Who speaks? Who listens?’, an essay about Het Reservaat and Critical Friends in 'The Search for the Spectator', edited by Jeni Welwin. ‘The Last Runner Wins’, a short story in a new publication edited by Amy Feneck.